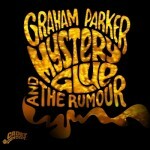 Share the post "Album review: GRAHAM PARKER AND THE RUMOUR – Mystery Glue"
You wait 30 years for a Graham Parker and The Rumour album and then two come along together. Well almost. Reforming the original line up a couple of years ago for ‘Three Chords Good’ after a generation apart, the band has clearly got the bug. ‘Mystery Glue’ is the follow up and oozes quality and assurance from every byte. The two most important aspects of Parker’s talent remain intact at this (dare I say veteran) stage of his career: his gravelly but sonorous voice; and his sharply observed and witty songwriting. The album is less aggressive than some of the band’s earlier outings. The classic ‘Howlin’ Wind’ in 1976 was an influential, energetic pre-punk landmark. The dominant moods here, however, are more mellow and laid back. The album is built around classic pop, bar-room rock ‘n’ roll, easy country and dollops of soul. All the time, Parker’s stories conjure images that knit the cuts together. That’s the real ‘Mystery Glue’ on show here. It’s easy to see why some of the best songwriters around – Springsteen, Costello and Weller – have cited Parker as an influence. ‘I’ve Done Bad Things’ is a perfect example. Clocking in at a little over three minutes, Parker takes us on a lyrical journey that involves robbing houses, ‘hands down big girls blouses’ and power in the White House. There’s room for a few bars of lush Hammond organ/guitar interplay and a couple of subtle changes of pace and intensity. The band’s ensemble playing is a hallmark of the album, and the sound has an easy confidence. Andrew Bodnar’s funk-fuelled bass beautifully underpins the reggae tinged ‘Fast Crowd’. Brinsley Schwarz on lead guitar is excellent everywhere, but brings a western feel to ‘Going There’, some sharp work on ‘Wall of Grace’ and a driving lick for ‘Swing State’. Maybe Bob Andrews’ keyboards steals the show though. Highlights are a delicious piano interlude that perfectly sets up the country rock ‘Railroad Spikes’, and his mood setting mock-pathos on album closer ‘My Life In Movieland’ which provides a platform for Parker’s brilliant, cynical, black-humoured narrative. This entry was posted in ALBUM REVIEWS, ALBUM REVIEWS (Mobile), All Posts and tagged album, Graham Parker and The Rumour, Mystery Glue, review. Bookmark the permalink.